I’ve been stuck on this one for a while, and it’s slowed down my reviewing because of it. 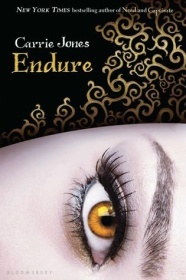 Something must have changed in my tastes since I read the last one because I just couldn’t get into Endure. It took me what felt like ages to get through Zara’s often immature inner monologues and barely plotted journey. It really felt like there was nothing happening. The characters went places, sought out things, even brought together a large scale battle, but it still felt like there was very little to the story. The romantic aspect was especially lacking, even though there was a love triangle. Neither boy brought much in the way of swoon-worthiness, leaving me wondering why I even bothered with this book. With Zara now a pixie, and a queen no less, it’s basically made her unappealing to her previously dead wolf boyfriend. Treating her with disdain, they barely manage civility. Zara’s hang-up on Nick was understandable considering the lengths she had gone to bringing him back from the afterlife, but that in itself showed just how much she had centred her life around the relationship, and needing him to keep herself going. Zara does ponder these thoughts occasionally, and other characters try and tell her that she needs to be more independent, but it doesn’t happen nearly quick enough. There are many instances, in fact, I have been able to flip the book open countless times and find paragraphs to quote that show just how immature Zara has become. The way she speaks, the way she thinks, it comes across as childish, and does very little to prove the gravity of the situations she keeps finding herself in. I get that she is not meant to be an adult, but it just seems as if Zara has been dumbed down in a way. Like I said, I never really noticed this before in the previous three books, aside from the overly cutesy nicknames Nick and Zara used for each other, but this time, the attempts at sounding young were glaringly obvious. It took me out of the story, and really made it a struggle to want to pick the book back up. There was an abundance of pop culture references spread through this one too. Again, we have Issie’s love of Buffy, but there a few more obscure ones tossed in this time around. I’m a bit hit and miss with how I feel about these. I like that the author is giving a shout out to these cult fandoms, but then again, it can lessen the story. I felt there were times when things could have been described in depth, painting a picture, but instead, a reference was thrown in that was supposed to do that job for us. It plays into the whole showing/telling debate—but that’s a whole other can of worms. Astley had lots of potential to step up and become the lead love interest, especially after how cute his old-set ways portrayed him to be. But unfortunately a lot of that was skipped. I didn’t feel like I experienced Zara’s romantic shift towards him through anything that Astley did, rather it just happened. I just didn’t feel it. As for the pixie drama going on around them, I thought the lead up, as well as final battle lacked something. There was a moment mid-way through the book where it seemed as if an interesting twist could have been unleashed, turning the tables on a certain character, but it was skipped over, which disappointed me a bit. It wasn’t twist-less, but even that wasn’t enough to save things for me. While I didn’t like the book, it did manage to wrap just about all of the plotlines from the previous three books up. It’s not the ending I was hoping for, but it’s still an ending. If you’ve read the earlier books, you’ll probably want to check this one out, if only for the closure.